Charles Dickens Biography : CHAPTER X. BIOGRAPHY OF CHARLES DICKENS: CHAPTER X. 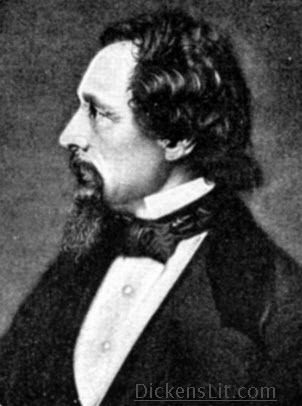 On his return to England, just after the Christmas of 1853, Dickens gave his first public readings. He had, as we have seen, read "The Chimes" some nine years before, to a select few among his literary friends; and at Lausanne he had similarly read portions of "Dombey and Son." But the three readings given at Birmingham, on the 27th, 29th, and 30th December, 1853, were, in every sense, public entertainments, and, except that the proceeds were devoted entirely to the local Institute, differed in no way from the famous readings by which he afterwards realized what may almost be called a fortune. The idea of coming before the world in this new character had long been in his mind. As early as 1846, after the private reading at Lausanne, he had written to Forster: "I was thinking the other day that in these days of lecturings and readings, a great deal of money might possibly be made (if it were not infra dig.) by one's having readings of one's own books. I think it would take immensely. What do you say?" Forster said then, and said consistently throughout, that he held the thing to be "infra dig.," and unworthy of Dickens' position; and in this I think one may venture to assert that Forster was wrong. There can surely be no reason why a popular writer, who happens also to be an excellent elocutionist, should not afford general pleasure by giving sound to his prose, and a voice to his imaginary characters. Nor is it opposed to the fitness of things that he should be paid for his skill. 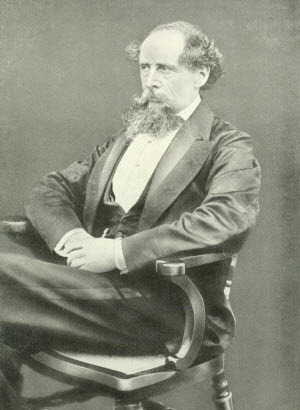 If, however, one goes further in Dickens' case, and asks whether the readings did not involve too great an expenditure of time, energy, and, as we shall see, ultimately of life, and whether he would not, in the highest sense, have been better employed over his books,--why then the question becomes more difficult of solution. But, after all, each man must answer such questions for himself. Dickens may have felt, as the years began to tell, that he required the excitement of the readings for mental stimulus, and that he would not even have written as much as he did without them. Be that as it may, the success at Birmingham, where a sum of from £400 to £500 was realized, the requests that poured in upon him to read at other places, the invariably renewed success whenever he did so, the clear evidence that a large sum was to be realized if he determined to come forward on his own account, all must have contributed to scatter Forster's objections to the winds. On the 29th of April, 1858, at St. Martin's Hall, in London, he started his career as a paid public reader, and he continued to read, with shorter or longer periods of intermission, till his death. But into the story of his professional tours it is not my intention just now to enter. I shall only stay to say a few words about the character and quality of his readings. That they were a success can readily be accounted for. The mere desire to see and hear Dickens, the great Dickens, the novelist who was more than popular, who was the object of real personal affection on the part of the English-speaking race,--this would have drawn a crowd at any time. But Dickens was not the man to rely upon such sources of attraction, any more than an actress who is really an actress will consent to rely exclusively on her good looks. "Whatever is worth doing at all is worth doing well," such as we have seen was one of the governing principles of his life; and he read very well. Of nervousness there was no trace in his composition. To some one who asked him whether he ever felt any shyness as a speaker, he answered, "Not in the least; the first time I took the chair (at a public dinner) I felt as much confidence as if I had done the thing a hundred times." This of course helped him much as a reader, and gave him full command over all his gifts. But the gifts were also assiduously cultivated. He laboured, one might almost say, agonized, to make himself a master of the art. Mr. Dolby, who acted as his "manager," during the tours undertaken from 1866 to 1870, tells us that before producing "Dr. Marigold," he not only gave a kind of semi-public rehearsal, but had rehearsed it to himself considerably over two hundred times. Writing to Forster Dickens says: "You have no idea how I have worked at them [the readings].... I have tested all the serious passion in them by everything I know, made the humorous points much more humorous; corrected my utterance of certain words; ... I learnt 'Dombey' like the rest, and did it to myself often twice a day, with exactly the same pains as at night, over, and over, and over again." The results justified the care and effort bestowed. There are, speaking generally, two schools of readers: those who dramatize what they read, and those who read simply, audibly, with every attention to emphasis and point, but with no effort to do more than slightly indicate differences of personage or character. To the latter school Thackeray belonged. He read so as to be perfectly heard, and perfectly understood, and so that the innate beauty of his literary style might have full effect. Dickens read quite differently. He read not as a writer to whom style is everything, but as an actor throwing himself into the world he wished to bring before his hearers. He was so careless indeed of pure literature, in this particular matter, that he altered his books for the readings, eliminating much of the narrative, and emphasizing the dialogue. He was pre-eminently the dramatic reader. 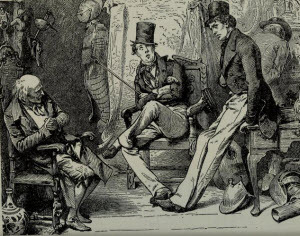 Carlyle, who had been dragged to "Hanover Rooms," to "the complete upsetting," as he says, "of my evening habitudes, and spiritual composure," was yet constrained to declare: "Dickens does it capitally, such as it is; acts better than any Macready in the world; a whole tragic, comic, heroic, theatre visible, performing under one hat, and keeping us laughing--in a sorry way, some of us thought--the whole night. He is a good creature, too, and makes fifty or sixty pounds by each of these readings." "A whole theatre"--that is just the right expression minted for us by the great coiner of phrases. Dickens, by mere play of voice, for the gestures were comparatively sober, placed before you, on his imaginary stage, the men and women he had created. There Dr. Marigold pattered his cheap-jack phrases; and Mrs. Gamp and Betsy Prig, with throats rendered husky by much gin, had their memorable quarrel; and Sergeant Buzfuz bamboozled that stupid jury; and Boots at the Swan told his pretty tale of child-elopement; and Fagin, in his hoarse Jew whisper, urged Bill Sikes to his last foul deed of murder. Ay me, in the great hush of the past there are tones of the reader's voice that still linger in my ears! I seem to hear once more the agonized quick utterance of poor Nancy, as she pleads for life, and the dread stillness after the ruffian's cruel blows have fallen on her upturned face. Again comes back to me the break in Bob Cratchit's voice, as he speaks of the death of Tiny Tim. 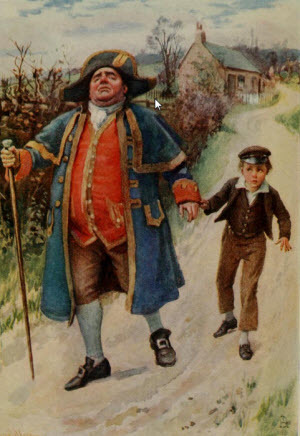 As of old I listen to poor little Chops, the dwarf, declaring, very piteously, that his "fashionable friends" don't use him well, and put him on the mantel-piece when he refuses to "have in more champagne-wine," and lock him in the sideboard when he "won't give up his property." And I see--yes, I declare I see, as I saw when Dickens was reading, such was the illusion of voice and gesture--that dying flame of Scrooge's fire, which leaped up when Marley's ghost came in, and then fell again. Nor can I forbear to mention, among these reminiscences, that there is also a passage in one of Thackeray's lectures that is still in my ears as on the evening when I heard it. It is a passage in which he spoke of the love that children had for the works of his more popular rival, and told how his own children would come to him and ask, "Why don't you write books like Mr. Dickens?"